There were nearly 220 wine producers exhibiting at the Raw Wine Fair this past Sunday/Monday. The Old Truman Brewery, off London’s Brick Lane, is an excellent venue for an event like this, but even so it was necessary to get there as it opened to have time to get around a few dozen tables before the crowds made it hard to taste, and even harder to spit. I managed only a little over three hours of concentrated sampling before I felt the need to adjourn to the Unfiltered pop-up at Super Brick (see previous post), and on returning a little after 2pm, the Old Brewery was heaving. A small word about “Raw”. The Fair was created by Isabelle Legeron MW, author of Natural Wine (CICO Books, 2014), and long time champion of natural wines. Raw, as explained on the cover of the Fair’s guide/catalogue, is an adjective meaning “in a natural state; not treated by manufacturing or other processes”. 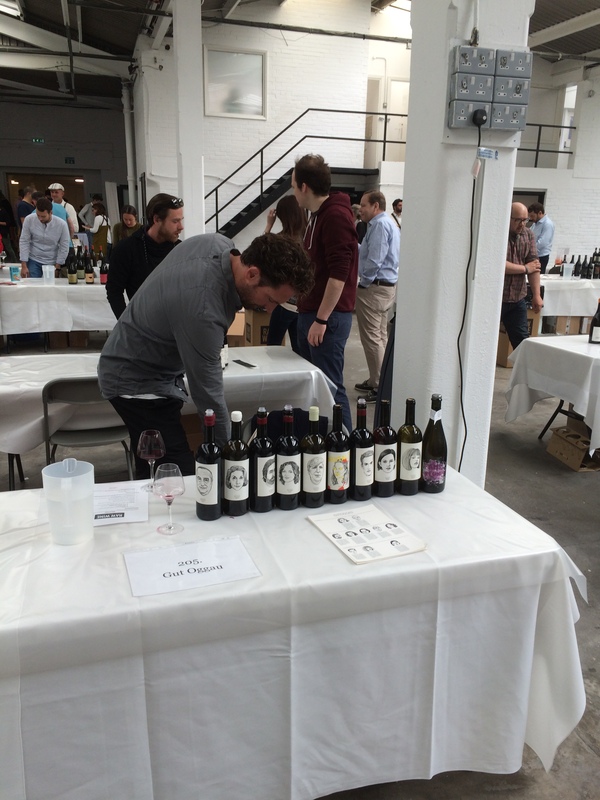 The wines at Raw Wine Fair are low, or no, intervention wines. They are also, it follows, very low in sulphur, or in many cases, have no added SO2. They cause some wine classicists to mock, or to go into fits of apoplexy, and it is true that some natural wines are highly volatile, some even verging on vinegar. Yet the best producers create a product which often transcends prosaic description, forging wines of true beauty, the like of which one rarely finds in more interventionist winemaking, except in the very best wines, which cost the earth. 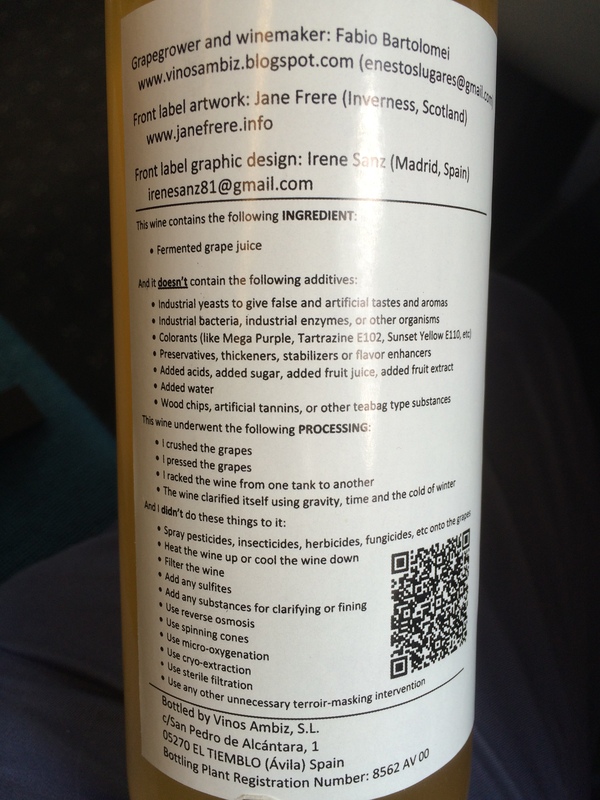 This back label (below), from the Spanish producer Vinos Ambiz, seems to encapsulate the Raw philosophy very well. Click on the photo to enlarge it if you can’t read the type. I particularly like the section called “This wine underwent the following processing”. I think putting “processing” in capitals is a lovely touch of irony. As for “the Earth”, and earth, the winemakers at Raw have a deeply symbiotic relationship with their land, and believe in retaining a balance in nature, and in their working environment. Some, like Stefano Belloti (who I wrote about in my pieces on the Real Wine Fair and the film Natural Resistance), and the Austrian producer Meinklang (see below), even practice mixed agriculture, farming cereal crops, fruit and livestock (Meinklang are perhaps at least as famous for their beef in Austria as for their wine). Others plant trees in the vineyard, or cover crops between the vines, in order to encourage a diverse ecosystem, something which is not always popular with the neighbours (look at recent incidents in Languedoc-Roussillon, specifically the vandalizing of plantings at Mas Coutelou – see fellow blogger and Coutelou helper Alan March’s piece here). On arrival I headed straight for Austria, tasting my way around these tables before spreading my wings elsewhere, so in Part 1 of my Raw round-up I’m going to talk about four of my current favourites from here. 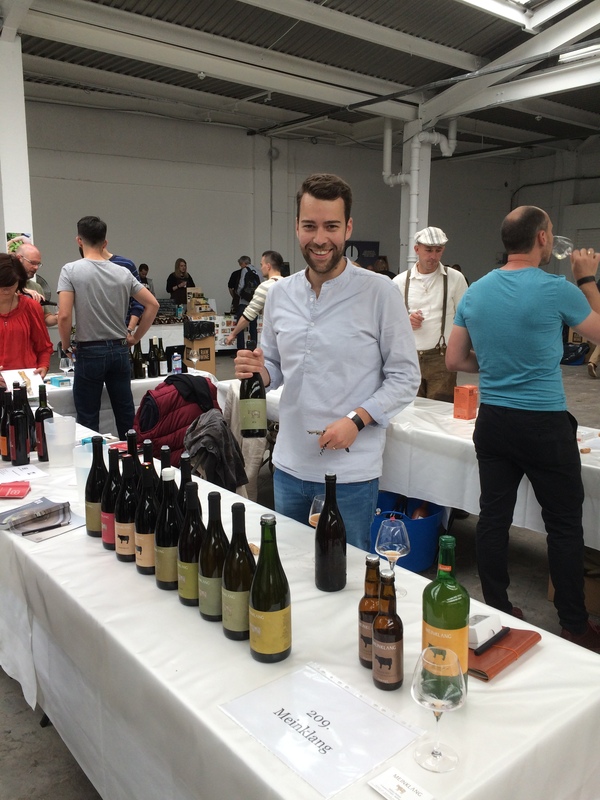 I’ve said it before, but whilst Austria doesn’t lack for established stars, there is also a genuine groundswell of exciting producers, many of whom follow the philosophy behind the Raw Wine Fair. Ten were showing on Sunday, and four of them rank among my current favourite Austrians. I’ve written about them before and make no apology for introducing you to their new releases. Rest assured that the second part of my Raw round-up will feature a good few winemakers I haven’t written about, including one or two new discoveries. I’ve been buying Claus’ wines from Newcomer Wines for some time, but this was the first time I’d met him. He’s quite confident, yet in a quiet way, just like his wines. Winemaking here is low intervention and biodynamic, although if you look at pictures of his modern winery in Göls (Burgenland), you might be forgiven for thinking the opposite. Claus was showing his Erdeluftgrasundreben Grüner Veltliner 2015, and the 2015 Pinot Blanc of the same name. Both were delicious, and, when tasted with the 2015 Blaufränkisch Kalkstein, showed the real freshness and fruit of the vintage – though remember that many of the 2015s on show at the Fair were either very recent bottlings, or, as in many cases, samples. Going on the taste Preisinger’s Blaufränkisch Erdeluftgrasundreben 2014, for example, there’s more on the nose, the product of having settled down a bit. This is a lovely wine, even just to look at. None of Claus’ lovely Zweigelt, nor his formidable Saint-Laurent, were available to try, but he is very pleased with his 2014 Pinot Noir, a variety increasingly favoured by some of the younger Austrian producers. I should probably keep this short. Gut Oggau would be hard to challenge for the top spot as my favourite Austrian producer. This time last year I was basking in similar sunshine to today, down in Rust, just a few kilometres away from Oggau on the western shore of the Neusiedler See. Do I wish I was back there now? Yes! Again, the 2015 vintage here looks very good indeed. Throughout most of Austria 2014 brought some challenging conditions. 2015 began with a lovely Spring and early summer, as we saw ourselves. The rains which came in mid-August were welcome, and were followed by more warm weather. Many producers described the 2015 harvest as “fairly relaxed”, which we all know, coming from wine makers the world over, means they are happy. Eduard was there to take me through the new wines, and I won’t deny my bias, making objectivity quite difficult. But Winifred (rosé), bottled only last Wednesday, was the height of seductive freshness, which again one could see throughout the range on taste. The wine I had never tasted before was “Brutal”. 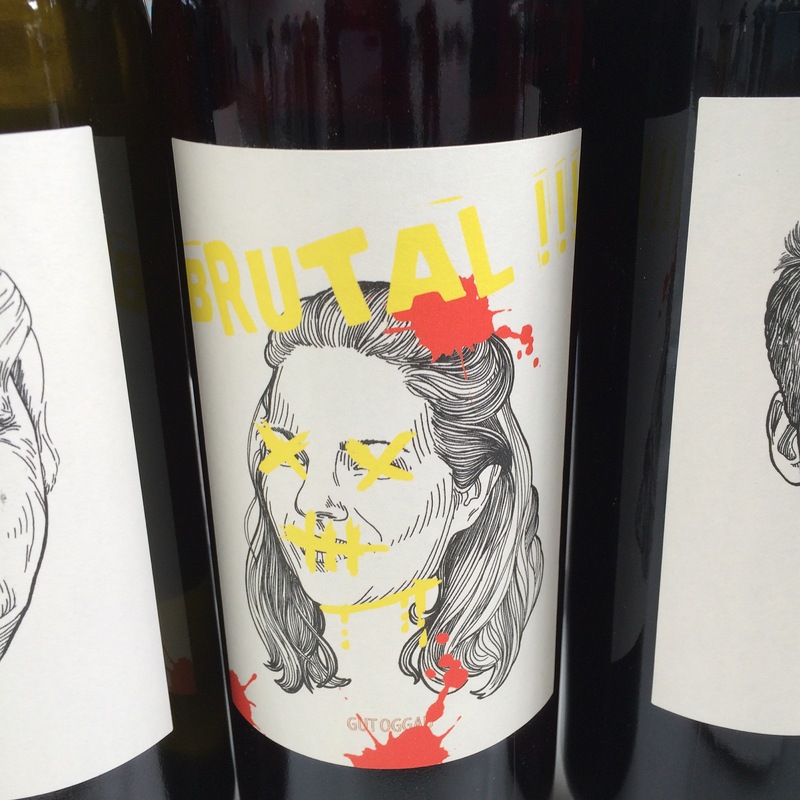 Brutal is a project spanning several countries, where nine winemakers have banded together to make a natural wine under one label. Domaine L’Octavin, the Arbois producer I have written about a few times, is also involved. Gut Oggau’s “Brutal” bottling is made from Roesler, a grape which is obscure even by Austrian standards. It’s a red cross between Zweigelt x (Seyve Villard x Blaufränkisch), named after Leonard Roesler, a former director of Austria’s oldest viticultural college. This bottling is pinkish-hued, darker than Winifred, and lives up to its name, yet it is refreshing and vivant, which I guess the the intention. The label, distorting one of the traditional Gut Oggau family images, bears the imprint of this iconoclastic project. This is another biodynamic domaine farmed by genuine thinkers with a passion for their 14 hectares of vines. Gut Oggau is imported by Dynamic Vines in the UK. Tschida is based in Illmitz, on the opposite, eastern, side of the Neusiedler See to Gut Oggau. Christian is a big personality, and when he’s wearing his leather jacket, perhaps a little daunting too. His philosophy is “let it run”, which, for his wines, means he won’t bottle them until he deems them ready. This can be up to five years after the harvest, so it is wise not to take his little joke seriously when he gives you a sample and says he will be bottling next week! I only tasted the 2015 Himmel Auf Erden (Heaven on Earth) wines (white, pink and red). The white blends Scheurebe with Pinot Blanc (mineral peach stone); the pink, Cabernet Franc with some skin maceration giving more texture than most rosé; and the red, blending Cabernet Sauvignon and Zweigelt. These are supposedly Christian’s “every day” range. At over £30/bottle they are expensive in that context, but they are lovely wines and are more affordable than the wines in the upper part of the range. Christian does like to crack a joke and pull your leg, but make no mistake, the wines are serious. Christian Tschida’s wines are available at Newcomer Wines. Note that Newcomer are in the process of moving from the Shoreditch Box Park pop-up retail units to a permanent store opposite Dalston Junction Overground Station. Thanks folks, a pain for me to get to, but I hope you thrive there. Regular readers will know that this is my producer of the moment. You can read a little about the background to this Pamhagen estate, right by the Hungarian border, here, where I also taste some of the wines they make over in Hungary, on the vineyard slopes of the extinct volcano of Somló. At Raw, Niklas Peltzer was showing the delicious Foam sparkler (a bottle-fermented pét-nat), two of the Graupert wines (Pinot Gris and Zweigelt), and their Burgenland Blaufränkisch, to begin with. The Blaufränkisch is the same wine I drank at Brighton’s Terre-a-Terre restaurant last month, simple but fruity and good value. The Graupert wines are made from relatively unkempt vines, left semi-wild, deliberately so. These vines produce small, thick skinned grapes. Already darker in colour when pressed, the juice is further macerated on the skins giving greater texture in both red and white. The aim, with a little bottle age, is greater complexity too. Meinklang make a very good still Pinot Noir (and also a Pinot Noir frizzante called Prosa, which I just have to find), but the wine I’d been aching to try was the Konkret Red. It’s the brother of the white “Konkret”, the first Meinklang wine I tried. The grape variety is Sankt Laurent, vinified in a 900 litre concrete egg. The concrete’s porosity is meant to allow micro-oxygenation of the wine. It adds a silky texture, which is certainly evident on the palate. But there’s a kind of ferrous, mineral, sandy texture as well, and it doesn’t lack bite. Quite a “wow!” wine, and worth the wait. Last but not least, a special edition wine with no name, as yet, and I was told I was one of the first to taste it. Concrete egg, three months skin contact, hand bottled, pale orange, fabulous. I’ve no idea what they will call this but I’ll look out for something new…although Meinklang’s range is large enough already. What I didn’t taste, I thought it might wreck my palate, was their beer. It’s made from spelt. I’m guessing that mentioning it will mean it’s all gone before I get back up to London to claim some. Such is life. No name, just like Arya Stark! 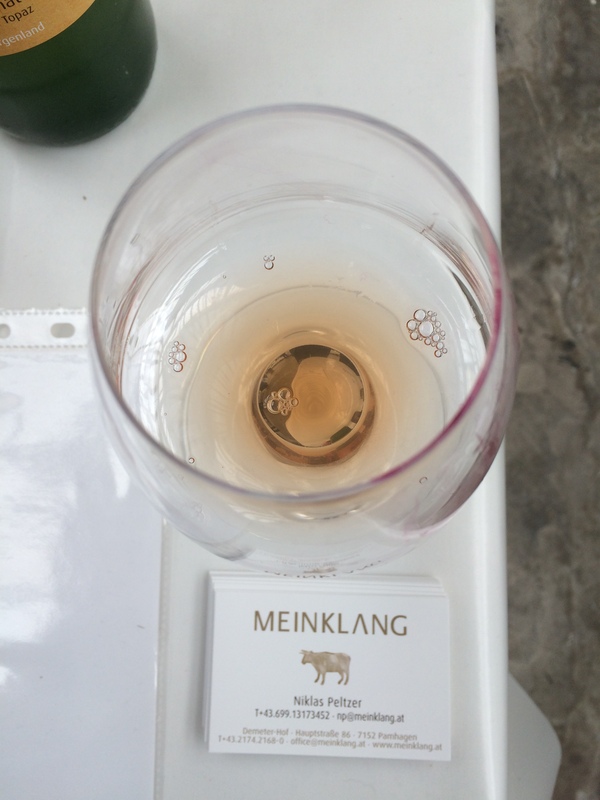 Meinklang wines are imported by both Winemakers Club and Vintage Roots, both importers stocking different wines in the range. Part 2 of my report on Raw will follow soon. This entry was posted in Austria, Austrian Wine, biodynamic wine, Natural Wine, Wine, Wine Tastings and tagged Austrian Wine, Brutal Project, Burgenland Wine, Christian Tschida, Claus Preisinger, Gut Oggau, Konkret, Meinklang, Natural Wine, RAW Wine Fair. Bookmark the permalink. Thanks for the link David. I tasted most of these producers this year and they provided many of my best moments of tasting, outstanding wines which has given me a real thirst to find out more.